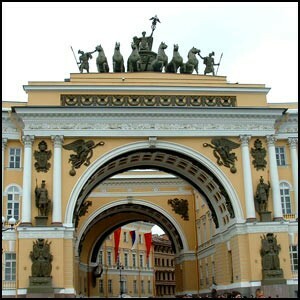 The city of St. Petersburg is only 308 years, but it has a rich history. When you get acquainted with the buildings of the city, almost every house has its own unique life and origins. Every home can tell a lot about its owners, the methods of construction and technology used in its construction. When you get acquainted with the history of foundation and construction of the city, it can not arise of admiration feelings for the builders and architects. Indeed, according to official history all the houses were built on the marshes, all work were performed manually were not mechanisms which facilitate the work of the serfs and workers. Basic mass of the people who worked in construction, was reportedly illiterate and uncultured. And only thanks to Peter I and invited him out of the "enlightened" European "masters" in Russia were able to overcome illiteracy and lack of culture and build a new capital. The fact that the official history impudently lie one can see at once at more familiarity with buildings and constructions in the historic city center. The first thing that surprised me is the front door of the right wing of the General Staff (address: Nevsky Prospect, 2). It seems to be not noticeable door, just facing this door is made of granite and in this facing stands granite patch, but so artfully made , that there is no the slightest gap, you can not even stick a razor blade. I immediately thought: how did it make manually and is it possible to do the same today? It turned out that it is theoretically possible, but it is very labor-consuming and not cheap pleasure. And it is just facing the door and its making by hand would take probably at least a month. Think yourself about it: to bring granite ,to abate at first into a flat board, then on template chisel through grooves then to remove defects to install the patch in the defect place and later to grind. And it is nothing, but in this facing is installed around the perimeter four patches. Это можно увидеть на photo 1 and photo 2. Construction of the "General Staff", at this approaching would drag for century. And according to available information a huge building of "General Staff" was built during 9 years from 1819 to 1828. Therefore, we can make an unambiguous conclusion that the facing of the door was not made by hand and was done with the help of an unknown right now, machine technology. As it turned out the miracles of St. Petersburg does not end, but only begin. 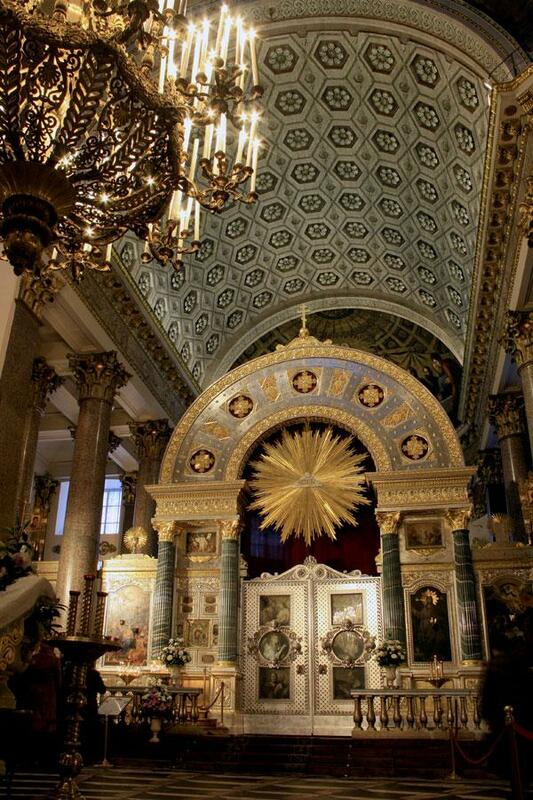 Many people know there is St. Isaac's Cathedral in St. Petersburg. If you bypass the cathedral by circle then from the Voznesensky Prospect, you will see the columns, broken with shells of German artillery during World War II. These columns were not repaired although restoration was carried out in Isaac's Cathedral in 1950-60 and the presence of shells traces from falling in the columns says that we do not own with technologies of repair from granite monolith. Our capabilities are limited with repair putting and painting plaster walls. However, this cathedral is notable for the fact that some columns there are patches of granite. Those patches from the Voznesensky Prospect there are four. If you've seen how install the patch on the asphalt, you can imagine the process of installing such patch to the feedstock of the column. Why do I write " to the feedstock?" Because to put such patch is possible only in time of manufacture of the column to replace the defects identified during the processing of single piece of granite of future column. Such operation is impossible to do manually. And judging by the weight of the column, according to various sources, from 114 to 117 tons, cleanliness of processing and polishing of the column, it can be quite obvious conclusion on the application of machine technology. In another way, i.e. to process the column manually is not possible. In any case, we still do not know such methods and technologies .The tool should be firm and has a great rate of work relatively to the product, so to speak about steam or water drive of such machine is not fit . A few words about the construction: the official information available to everyone, inform the following: construction of the cathedral began in 1818. The official sources do not mention about the use of machines and lifting machines for the construction of St. Isaac's Cathedral. Weight of the upper colonnade columns is 64 tonnes and a height of the colonnade Is 41 meters For comparison, I will say that this is the height of the 14 th floor of the house. Machines capable to lift such weight to height do not exist nowadays. the version of the manual installation of the colonnade columns with weight of each 114-117 tons is possible somehow to accept ( purely theoretically), all attempts to explain the manual (machineless) assembly of the upper colonnade are not tenable. Inside of St. Isaac's Cathedral surprise only increases. Imagine that someone pulled out a large piece of pink marble and then sawed it into several pieces, made from one piece the column, cut from the other panels with thickness 10-15 cm and with length in 6 meters. But that's not all: the column first was ground around then were cut grooves in it and then left convexity inside of groove at the bottom of the column and then sawed the column along in two halves and installed these halves as decorations along the walls. The same groove with convexities cut through the panels. Technology and machinery with use which is possible to do this we have no until now. . To refer the fact that it was built by aliens or representatives of the lost civilization (as in the case of Egyptian pyramids) is not necessary, because St. Isaac's Cathedral was built, according to official history, at least, 150 years ago and about this time we know almost everything. It turns out that the existence of this building contradicts to the official version of history. In public buildings of St. Petersburg were widely used various columns, especially in houses built in the 18th and first half of the 19th century. These are General Staff building, Tauride Palace, Central Naval Museum, Admiralty, Cathedral of Transfiguration of all the guards, Beloselsky-Belozersky Palace and Moscow railway station. An example of such construction is the Kazan Cathedral. There are 96 external and 50 internal in it e.a . columns are very important part of the building. The external columns are made of marble interior of granite, the weight of the columns is not mentioned, the columns are whole it can be seen in the photo. This temple was built for 11 years, from 1800 to 1811 years. The possibility of such building was determined with two important factors: the cost and time of making one column and other structural elements. To produce 150 identical columns for 11 years (excluding construction) without use of machines and tools is impossible. Also it is necessary to consider the Alexander Column. This magnificent monument was built for 5 years in the period from 1829 to 1834 years. The basis of the monument is rod of column in length of 23 meters with diameter at the base of 3.5 m and above of 3.15 meters (i.e. cone). The mass of the cone is 600 tons. Exploring the workmanship of the column, its shape and weight, it can be clearly concluded that without mechanisms and machines to make it was impossible. This column we can not build even now, as we do not have such technology. Moreover, we have no technology to get such a monolith from career, and most importantly we can not carry еit to the place of manufacture and then - to the place of installation! The most obvious example is building of Hermitage. Its construction began in 1754. According to the official version of history in this period of time in Russia, the population was totally ignorant, the industry was very poorly developed. There were supposedly only a few Demidov’s factories behind the Urals, a few ones in the Tula province, somewhere met a few stone-cutting workshops, employing various "Danila-master." However, let's look attentively at the building of the Hermitage. To say that there are a lot of columns in it it's nothing to say. 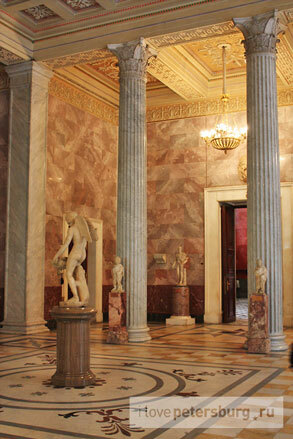 The Hermitage has thousands of columns. They are different in sizes and shapes and are made of different materials. In the Internet you can find many old paintings of the Hermitage, and contemporary photos: 1, 2, 3, 4, 5, 6, 7, 8, 9, 10, 11, 12,13. The design of the building is used a lot of so-called typical products of the time: these are supports for the columns and hatchways, floor supports, flights of stairs and railings, floors and balconies. The building itself was built for 8 years..
All this was made not by hand. . All these elements were produced in different factories, were brought to the place and assembled. To construct such building for such short time and with such stunning quality without the use of construction equipment and power lifting mechanisms is impossible! So that to assemble quickly all the elements they should fit together without any kind of overpatching but it says about presence in that time standardization and certification of products (like in the USSR State Standards), about the highest level of manufacturing technology ( compared to the present level ) about broad cooperation of enterprises throughout the state. Moreover, to design and build such building it is required the corresponding project documentation with tens thousands of pages. To develop design and technical documentation of this size and level, it is necessary to draw the whole designed institute. And all historians say that in Russia, almost everybody were illiterate at the time! But to make building elements and assemble them into the whole should be people obviously not illiterate, but with a high level of education. And neither illiterate peasants nor semiliterate other experts could not do this in principle! The Europe was at that time still a very peculiar place and was not capable to participate in such construction. To construct in another way such a building as the Hermitage, is quite impossible! According to existing today and imposed to us notions of historical scholarship about condition and development of society and State at the time, this and many other buildings should not exist. But they stand despite of numerous efforts to destroy them! They may notice fairly that most of these constructions were built in the 19th century (200 years ago ), and who were those uneducated first builders of St. Petersburg? The first builders actually did it , but building of Hermitage was built 50 years after the founding of the city (260 years ago, in the 18th century), and built it allegedly incompetent, uneducated peasants from surrounding villages. And today the majority if not all of these buildings we can not build! 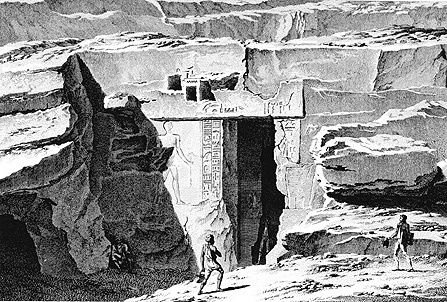 But how have built our supposedly ignorant ancestors, who allegedly quite recently were living in mud huts? No explanation for this! But those who ask such questions they try quickly to shut up! What shall we do? It is necessary to find real information about our past and revise the whole story written for us. Let's ask another interesting question: Can we now construct such building for 8 years? The answer is simple - NO. And for 20 years? Answer - maybe, if we beforehand develop the necessary technologies of monolithic products processing , build new factories, invent new transportation and lifting equipment, develop a system of standards and everything rest. And if remember, that it is needed to design and build all the elements of decoration and ornaments, the construction will be last for 50 years. In addition, the cost of such building will be much more than all the sports facilities of Sochi taken together.